I’ve been prepping for my trip to Ireland for months, and I’ve been reading and rereading all kinds of books about the Emerald Isle. These are just a few of the books I’ve found helpful for this trip. Since I tend to take more books than clothes on a trip, well, let’s just say my suitcase will be heavy! I start my trip planning with the utilitarian travel guides. They are encyclopedic – a little information about many, many places. But they are always helpful when planning a general itinerary. Frommer’s Ireland 2009 by Christi Daugherty and Jack Jewers: Frommer’s sent me a copy of their guide, and I was really excited to see that this book includes a really nice fold-out map. I’ll be driving for the first part of my trip, so I know I’ll be using it a lot. I’ve always liked Frommer’s guides, and I am a big fan on their Moments and Tips sidebars – really useful tidbits that are color-coded within the book, so they are easy to find. 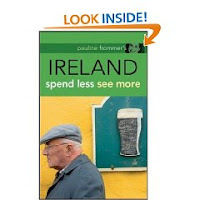 Ireland: Spend Less See More by Dr. Keith Bain and Emily Hourican: I spent a great week with Pauline Frommer last summer at a writer’s conference. She kept talking about her new thrifty travel series, and this is my first time to travel with a copy (compliments of Frommer’s). In fact, it was just published last month! I am particularly looking forward to the restaurant recommendations as I am traveling on a budget to be sure. The Rough Guide to Ireland: On my last trip to Ireland, I used the Rough Guide, and it will go along in my suitcase this time, too. The Dublin section in the Rough Guide is quite good with thorough and accurate information about the literary destinations in the city. A good historical foundation is important for any trip of consequence, so I’ve been boning up on my Irish history – fascinating, bloody, and rich. There’s a lot more to it than the potato famine! How the Irish Saved Civilization by Thomas Cahill: I love this book. I’ll just put it out there. Cahill writes about the Dark Ages in Europe when the great heritage of Western literature – the works of the Greeks and Romans as well as the writings of early Christians and Jewish writers – were confined to monasteries across Europe. As it turns out, the Irish isolation saved some of the world’s great treasures from fire, pillaging, and plunder. Way to go, Ireland! A Traveler’s History of Ireland by Peter Neville: I am also a big fan of the Traveler’s History series, and I own several titles. The Ireland guide will definitely be in my bag. A Short History of Ireland by Martin Wallace (Appletree Pocket Guides): It is short. The book lives up to its title, but it is a great introduction to Irish history. Plus, this cute little book truly is pocket-sized. Very handy! I bought this book on my last trip to Ireland. It isn’t easy to find in the US, but it is worth the hunt. Round Ireland with a Fridge by Tony Hawks: I laughed. I laughed. And I laughed. Tony Hawks hitchhiked around Ireland lugging a mini-fridge, and he lived to write about it. This is a fabulous look at the generosity and love of the Irish people many of whom took in a strange man carrying a refrigerator. 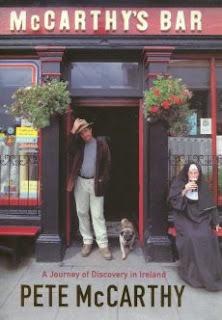 McCarthy’s Bar by Pete McCarthy: Another funny and charming book, writer and broadcaster Peter McCarthy set out to visit all of the bars in Ireland that carried his last name obeying one of the traveler’s rules: never pass a bar that has your name on it. Traveler’s Tales Ireland: A collection of accounts written by writers as well-known as Frank McCourt, Thomas Cahill, and Maeve Binchy and others by travelers who had great adventures. Colm Toibin’s account of climbing Croagh Patrick convinced me that I won’t attempt the climb – at least not on this trip. Now, with Ireland’s rich literary tradition clearly I’ll be making a few literature-related stops. Indeed, I’ll be in Ireland on Bloomsday (June 16) – though I won’t have made it to Dublin yet. 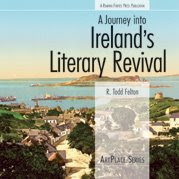 A Journey into Ireland’s Literary Revival by R. Todd Felton: My good friend, Todd, has written a fantastic guide to literary Ireland. With characters such as Yeats, Synge, and Gregory as guides, he writes elegantly about significant spots in Galway, the Aran Islands, Mayo, Sligo, Wicklow and Dublin. Novel Destinations by Shannon McKenna Schmidt and Joni Rendon: If I were grading this book, I’d give it an A for information and an F for organization. It is full of fantastic tidbits and little-known locations about popular writers like F. Scott Fitzgerald, Charles Dickens, and James Joyce (good for my purposes). But as a travel planner it is difficult to use. Because it isn’t organized geographically and it covers locations all over the globe, it is clunky. And finally, a few selections of Ireland’s literary history… and present. The Oxford Anthology of English Literature: Volume VI (Modern British Literature): I’ll be carrying this with me for sure. It isn’t all Irish, but it contains selections from Ulysses by James Joyce (perfect for my Bloomsday celebration) as well as poetry by many of Ireland’s greatest poets including Yeats. Angela’s Ashes by Frank McCourt: I cried. But it is beautiful. 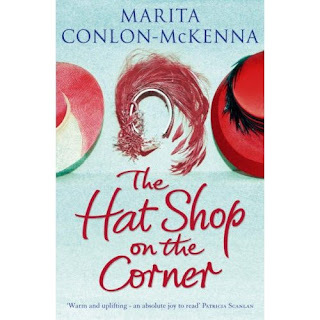 The Hat Shop on the Corner by Marita Conlon-McKenna: Ireland’s queen of chick-lit. I bought my copy of this charming novel in Dublin on my last trip, but it looks like it is now available in the US. A Star Called Henry by Roddy Doyle: This heartbreaking novel is set during the Irish Rebellion. It is funny, sweet, sad, and gorgeous – as well as a glimpse into the hardships of Ireland in the early 20th century. That’s just a start. Ireland is a land of poets and word-smiths, and it is impossible to do more than scratch the surface here. What books about Ireland or by Irish writers do you love most? Angela: Have you checked out the recommendations at A Traveler's Library? If you're going to the Aran Islands, Synge's book on the islands and his plays are indispensable, as is some of the literature of the islands, but you can pick that up when you get there.Literary festivals are held in every nook and cranny of Ireland because there are so many native authors, so you're bound to find some new ones as you travel. fantastic list, angela!! i love todd felton's book - that's a winner! we're headed to ireland in september and appreciate your great list! thanks!